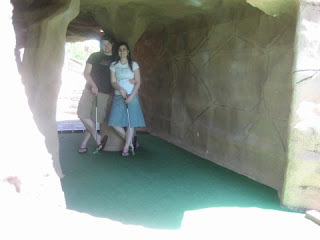 Andrew and I had a fun little mini-vacation on Monday/Tuesday. 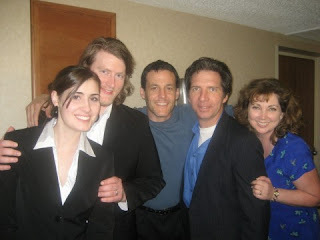 We landed a paid gig as actors in a Murder Mystery dinner at Tan-Tar-A resort in Osage Beach. Murder Mystery USA, the company we worked with, is based in California and they sent out an email requesting local actors for their one-night murder mystery dinner. We haven't actually received payment yet, but we are supposed to receive compensation for our time and travel. They also picked up the tab for our nice 7th-floor, balcony, lake-view resort room. Anyway, GREAT experience! I "killed" Andrew with a ballpoint pen during the event and then had a pretty dramatic hysterical widow scene. It was my official first "stage cry" - so I was pretty thrilled! Overall, the event was just really fun. The premise was that we were on staff at the resort, and so we spent the night making our way around the tables, conversing with the people, refilling their drinks, trying to fit in with everyone... It was such fun! The guys in charge of the event told us that the company will keep our names in their file and call us again for future events - there's one in Excelsior Springs in the fall, so I'm hoping we get a call!! 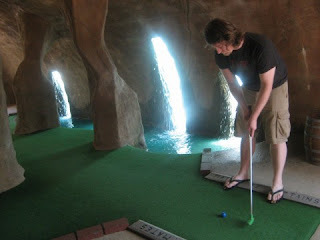 Mini-golf at Pirates Cove Adventure Golf - we did the Blackbeard course and I got a hole-in-one!!! That has never happened before, so I was thrilled. I was jumping up and down like a child. The water was dyed bright Kool-aid blue - interesting, but also a little freaky. 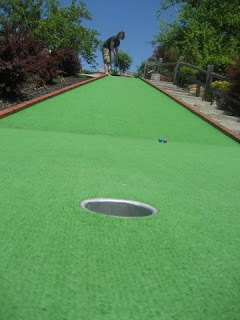 The whole course seemed to be trying to get you to knock your golf ball in the water. While we came close several times, we managed to avoid this catastrophe. The Osage Beach outlet mall!! I got my shopping fix at Gap (new hoodie because my wonderful favorite perfect hoodie has a huge grease stain on the front and I was unable to wear it! ), Gymboree (sweet baby girl clothes for a friend who is expecting! ), and Icing (cute necklace to wear to Seth and Elisha's wedding on Saturday). 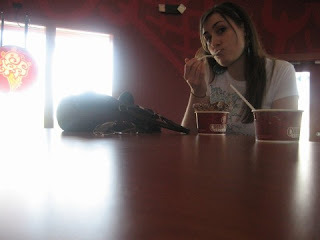 Huge amounts of yummy ice cream goodness at Coldstone. I had the Oreo Overload in a chocolate-and-sprinkle dipped waffle bowl. I ate about 3 bites of the bowl and maybe half of the ice cream before I felt so incredibly full I could not continue. :\ Andrew had a more reasonable regular plain bowl of Cookie Doughn't You Want Some and naturally finished all of it. Yes, Shoney's. 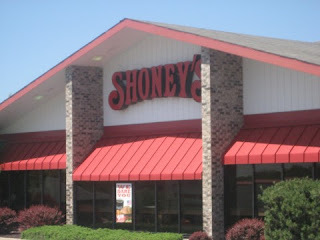 If you're like me - or like I was before yesterday - you think that all Shoney's restaurants have closed down and ceased to exist. And welll...if they haven't already, then they should. We eagerly followed the crowds of senior citizens into the building, hoping for some delicious food and fun memories from long-ago days. 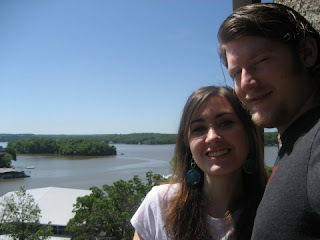 All we got was a lot of really icky buffet food, nasty water, and a general unpleasant feeling from all those around us. This was quite possibly one of the WORST restaurant choices we have ever made, and we have vowed it will never happen again. Definitely would not eat there now. You're right; it's hard to believe there are any still in existence. I forgot about the suckers in the bear tummy! LOL! I'm kind of mortified that I ate there only like five years ago. Definitely wouldn't now!